Sheebah Karungi and Lydia Jasmine join Eddy Kenzo and Bebe Cool to represent Uganda in this year's edition of Coke Studio Africa. While Sheebah is making her debut to the show, Jasmine is making her return after last year's Big Break segment. She performed alongside Bahati (Kenya) and Kiss Daniel (Nigeria). "My dream is to be the biggest superstar I can ever be. Being on Coke Studio Africa this year is one of the things that make me feel like I'm on my way now," Karungi said, during the unveiling press conference at the Stanley hotel, Nairobi. 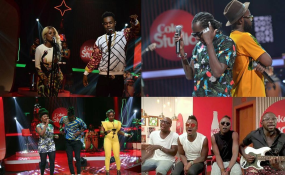 Coke Studio Africa is Coca-Cola's flagship African music show. It is a non-competitive show bringing together diverse African music talent for world-class showcases, while giving upcoming artistes the opportunity to work with some of the best local and international music and production talent.